Infamous 'Balloon Boy' Balloon Bought : The Two-Way A so-far anonymous bidder paid $2,502 for the flying machine that didn't carry young Falcon Heene high above Colorado in 2009. Proceeds from the sale are supposed to benefit victims of Japan's March 11 earthquake and tsunami. "An unnamed man from Aurora [Colo.] won an online auction for the flying-saucer shaped craft that was at the heart of the 2009 Balloon Boy fiasco in Fort Collins," The Coloradoan reports. The price he paid: $2,502, Perry Rausher, the attorney for Richard and Mayumi Heene, tells the newspaper. The Heenes, as you may remember, are the couple who told authorities that then-6-year-old Falcon was aboard the craft as it raced across the sky near Fort Collins. 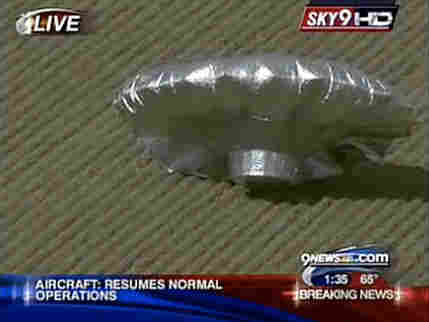 Thanks to the cable news networks, the nation got to watch as the contraption flew — and then landed with a hard bump in a field. When authorities got to the scene, Falcon was nowhere to be found. He had been hiding at home. His parents, as the Coloradoan reminds us, "served brief jail terms for their roles in the hoax." The family now lives in Florida and says the money from the sale will go to helping victims of the March 11 earthquake and tsunami in Japan. Mayumi Heene is from Japan.